It’s a Wednesday night in Miami and you start to get that feeling that you usually get at the end of your workday on Friday. That tingling sensation that starts in your brain and slowly works its way down to your legs. The average 9-5er labels Wednesday as ‘hump day,’ a day that has its peak at 3PM, then turns into the slope that leads into the weekend. But sometimes you have to have a nightlife appetizer that’ll hold you off until Friday night. That’s where Live Sessions at The Standard come in. As he mentioned, Off the Radar first kicked up on Wednesdays in 2005 at Buck 15 where Milian, local DJ Danny Ashe and Tom Wareham would provide all the sound. From that came offtheradarmusic.com, a blog created to inform the masses of up and coming bands and artists that everyone should lend an ear to. While other weekly parties that take place prior to the weekend start off at around 10PM and peak at a time when you should actually be in bed and getting ready for those TPS reports in the morning, ‘Live Sessions’ kick off at 8PM and end at midnight, leaving you with the pleasant choice of calling it a night, or continue the socializing. But this isn’t the typical ‘Do or Die’ verdict that you’re subject to on weekends, it’s more of a ‘Would you like desert?’ query. “The Standard's bar has to stop serving liquor at midnight, so we've been pushing more of an early dinner/hang thing, which we feel works better, especially for a week-day party when many people have to work the next day,” Milian says. Think of it as having the happy hour vibe (the drinks are extremely reasonable), but with a chic and laid back style that offers an impeccable taste in music. The crowd that frequents The Standard on Wednesdays are the same friendly faces that you’d bump into on a Friday night at The Vagabond, starry-eyed young adults who enjoy a good drink accompanied with a little rug cuttin’. This event is only one of a few select in a city whose music taste is dominated by mainstream music and culture. Until that actually happens, the citizens of this great nightlife haven have to learn to appreciate the little events that make a difference. The ones that are curveballs outside of the normal fastballs. Sooner or later the growing live music scene and art movement that’s taking place will finally bring Miami the respect that it deserves outside of the typical big-club reputation that it currently holds. P.S. 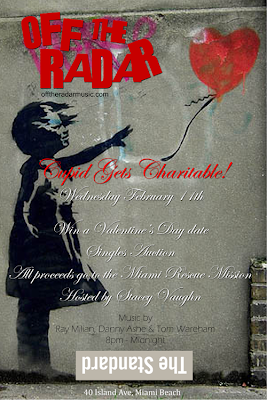 ::: Tomorrow (2/11) @ Off the Radar/The Standard as we Host a Valentine's Charity Singles Auction to benefit Miami's Homeless. We will be auctioning off Valentine's Day Dates with some of my Miami's most eligible Bachelors & Bachelorettes with all the proceeds going to Miami Rescue Mission. Should be a blast + it's for a good cause. Don't miss it! Auction Begins @ 9 PM in the Standard Lobby. Plus as always amazing music selections by Bar from 8 till Midnight courtesy of offtheradarmusic.com!